"What is your Phantom Menace number?" has become a standard question for guests on The Phantom Menace Minute. 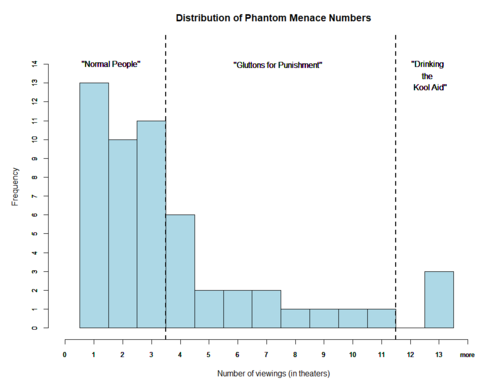 It refers to the number of times that the person has seen The Phantom Menace in theaters (though the responder will often discuss how many times they've seen it since then too). Alternatively, the Phantom Menace number can be thought of as the amount of time (either time into the movie or number of viewings) that it took the guest to decide that he or she didn't enjoy The Phantom Menace as much as the Original Trilogy. The phrase was coined by Alex in minute 96 of ROTJ. Chris Radtke 11, in two hemispheres of the Earth. David Hahn 2 in the theater, once on DVD. In the background. While he was doing something else. Matt Belknap At least 3 times. Eric Carney At least 3 times. J. K. Woodward 3. Twice in English, once in German. He actually liked it better in German, although he said Jar Jar was worse. Keith Phipps 2 in theaters. Maybe once more since then. Ryan Haupt 1 very memorable time, probably one or two other times after that. Adam Stearn Either 1 or 2, he can't remember which. This page was last modified on 17 April 2019, at 08:45.